Published: March 3, 2013 at 10:19 p.m. Updated: March 4, 2013 at 08:37 p.m.
We now know the particulars of Joe Flacco's new contract. As you might expect, it's a very good deal for the reigning Super Bowl MVP. NFL.com's Albert Breer reported Sunday night that Flacco's six-year contract with the Baltimore Ravens is worth $120.6 million, according to two sources who have seen the contract. 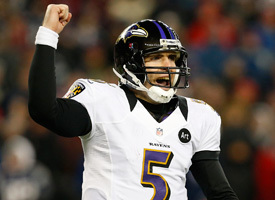 Breer and NFL.com's Ian Rapoport reported the deal also has been finalized, according to Flacco's agent, Joe Linta. The one remaining detail the sides must work out Monday deals with marketing related to the contract. However, the issue is expected to be resolved quickly, Breer reported. As Breer pointed out on Monday's "NFL AM," Flacco's deal in essence is for three years. That's because he's due $29 million in the fourth year, which "will not be workable" unless the salary cap explodes once money from national television contracts kick in. Breer added that Flacco's 2013 salary cap number is less than half of New England Patriots quarterback Tom Brady's. "He certainly did the Ravens a favor," Breer said on "NFL AM." Two numbers in the agreement jump out immediately. The first is the guaranteed money -- $52 million (New Orleans Saints quarterback Drew Brees has been the benchmark for guaranteed earnings with $60 million from the megadeal he signed last July, including $40 million in the first year; Brady also gets around $60 million guaranteed in the extension he signed last week.) Second, Flacco's salary-cap number in 2013 is $6.8 million. This obviously is a team-friendly figure that will give the Ravens much more flexibility this offseason than previously thought. Take a look the best photos of Joe Flacco through the years. Breer detailed the specifics of Flacco's contract. In 2013, Flacco will get a fully-guaranteed $29 million signing bonus and a $1 million base salary. In 2014, he's due a $15 million option bonus (guaranteed for injury) and a $6 million base salary. In 2015, it's a $7 million option bonus (guaranteed for injury) and a $4 million base salary. In 2016, he will earn an $18.2 million base salary. In 2017, the base salary increases to $20.6 million, and in 2018, it's a $20 million base. Ravens coach John Harbaugh texted the following reaction to Breer: "Just very happy for Joe, his family, and also for Ravens fans. He always been our QB. So to me, this is very fitting." A text from linebacker Terrell Suggs to Breer consisted of one word: "AWESOME!!!!!!!!!!!" Flacco's deal was the product of a perfect storm of circumstances. Had the Ravens decided to lock him up earlier rather than have him play out his contract, they likely would have saved millions. Instead, Flacco got another chance to prove his worth and potential. And that he did.